A "Masterwork" by Miceli Custom Homes, this Town and Country residence illustrates the firm's renowned skill and craftsmanship. 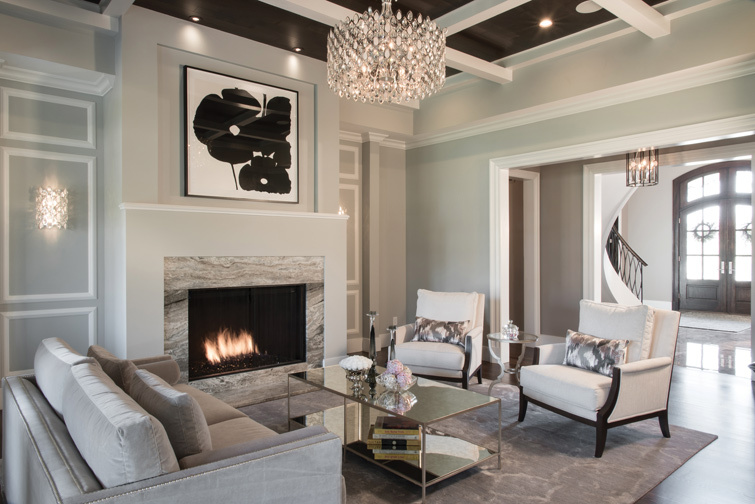 Exquisitely upholstered Designmaster chairs, a Marge Carson table with dynamic circular base, ceiling trim designed by Tonella and a graceful chandelier create visual “rhythm” in the formal dining room. Three contemporary florals by Donald Sultan add a touch of color. The great room fireplace is a dramatic focal point, with its granite slab surround and abstract Donald Sultan floral. Dark wood planks fill the ceiling coffers, and Ethan Allen furnishings, mirrored accent pieces and a crystal drum chandelier from Metro Lighting complete the chic-yet-comfortable décor. Fresh and sophisticated, the open kitchen/breakfast area integrates many of the home’s design elements — a soft gray-and-white color scheme, transitional Fox Creek cabinetry, Ethan Allen seating, an Indonesian rosewood dining table and Mont Blanc quartzite topping the counters and 12-foot contoured island. Accessible from both the hearth room and great room, the wet bar showcases glass front cabinets with custom-designed mullions and a stunning backsplash in a glass “feather” pattern by Premier Tile. Facing a fireplace framed with floor-to-ceiling marble tiles, the master bedroom features an upholstered Arhaus bed and Mitchell Gold + Bob Williams nightstands. 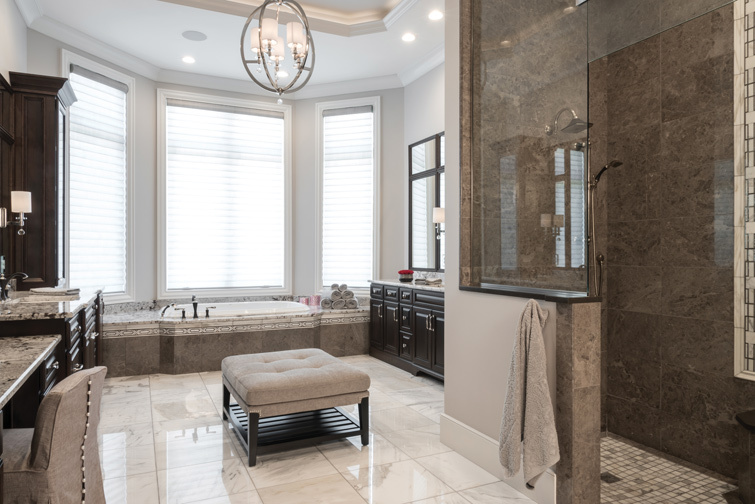 One of the designer’s favorite spaces, the lavishly appointed master bath gleams with marble, granite and a variety of decorative tiles. The highlight of the lower-level entertainment area is the wine room, uniquely enclosed with glass barn roller doors. Fitted with custom racks by Fox Creek Furniture and Woodworks, the wine cooler’s rustic effect is further enhanced by a brick floor, set in a herringbone pattern. A haven for overnight guests, the lower-level bedroom is elegantly furnished and overlooks the scenic rear yard. Located on a quiet residential street in Town and Country, the one-plus-acre property was acquired by Miceli Custom Homes in 2015, and CEO Frank “Bud” Miceli had already begun designing a custom inventory home for the site. Meanwhile, his future clients were thinking about moving closer in from Wildwood. On viewing the property, the couple decided it was the perfect setting for their new residence and chose Miceli as their builder. 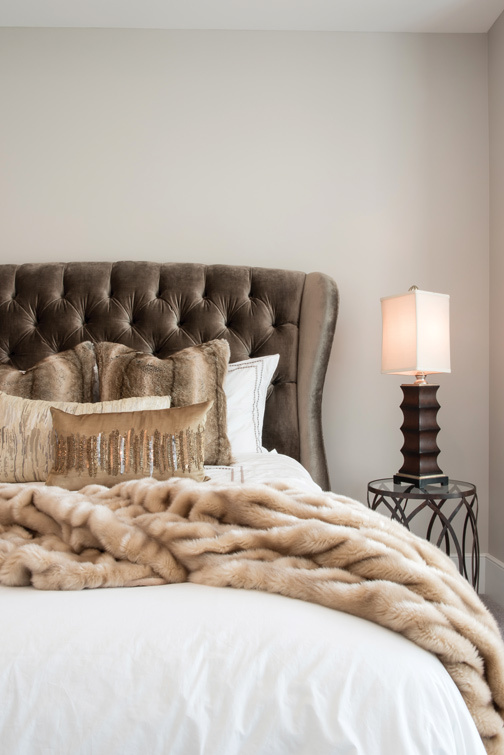 “When I think of Miceli, I think ‘prestigious, higher-end, quality,’” says the wife, confirming that the company name has been synonymous with finely crafted luxury homes for three generations. The 1.5-story designed by architect Donna Boxx was already in progress and had many of the elements the couple was looking for, and the group worked together to modify the plan. “We wanted something timeless, not trendy,” the owners agree, and Miceli quickly grasped their objectives. “We’re willing to vary from the norm to meet our customers’ expectations,” Bud states, noting that his firm’s flexible designs are recognized for their harmonious blend of eclectic architectural features. The owners were envisioning a dignified exterior combined with a transitional interior, and the existing plan was transformed into a magnificent English Manor-styled residence, with two front terraces, five bedrooms and a total of 9,000 square feet of finished space on the main and lower levels. Before construction could start, however, there were site challenges that had to be resolved, and Bud Miceli was onsite daily to supervise the effort. At the rear, a steep drop-off required a huge amount of fill and careful placement of retaining walls. The treeline was so overgrown with honeysuckle that the creek running through the property was obscured, and the invasive vegetation had to be removed. Locating the infinity pool off the lower level walk-out made piering and “cradling” essential, and in the front yard, two huge trees were reluctantly sacrificed to allow for installation of the geothermal system’s wells. Once site development was finally completed, however, construction of the home began in mid-2016. 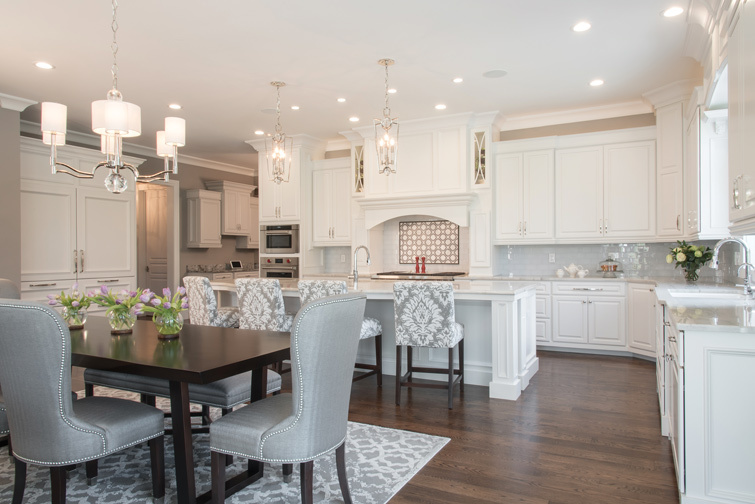 Involved in the design process from the outset, Karen Tonella of Dynasty Interiors established a highly congenial working relationship with her clients and Miceli’s construction supervisor. Drawing from the wife’s “inspiration pictures,” Tonella made the color selections, designed the interior spaces and created many of the home’s most striking finishes. Dominated by soft grays and white, the décor is fresh, bright and sophisticated. Five-inch hickory plank flooring blankets the activity areas, and curved lines and subtle quatrefoil motifs are frequently repeated, creating a visual “rhythm” throughout the home. The theme is first apparent in the foyer, where Tonella custom-designed the curvilinear wrought-iron balusters lining the curved main staircase. Off the foyer, the formal dining room is centered by a Marge Carson table with a dynamic circular base, silver edge and muted quadrefoil design in the surface. 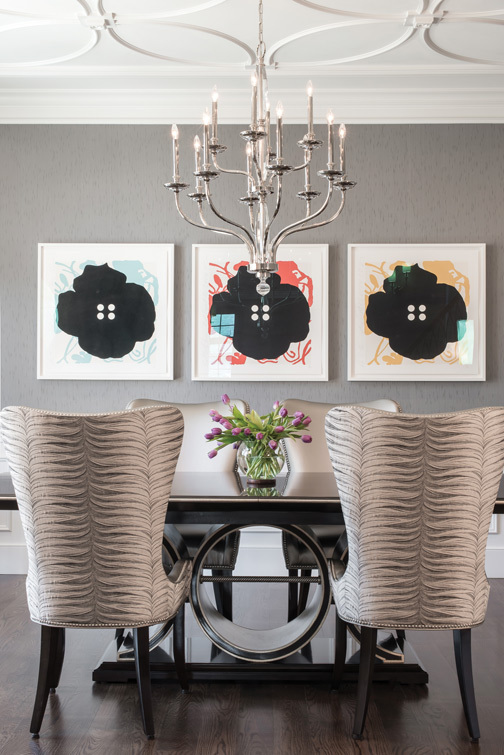 The Designmaster chairs are upholstered in a silvery fabric, complementing the table edge, and overhead, the ceiling is embellished with elegant curvilinear woodwork, designed by Tonella and fabricated by Jeff Berry of JB Construction. Much of the family’s time is spent in the open kitchen/casual dining/hearth room area, which was significantly expanded from the original floor plan. 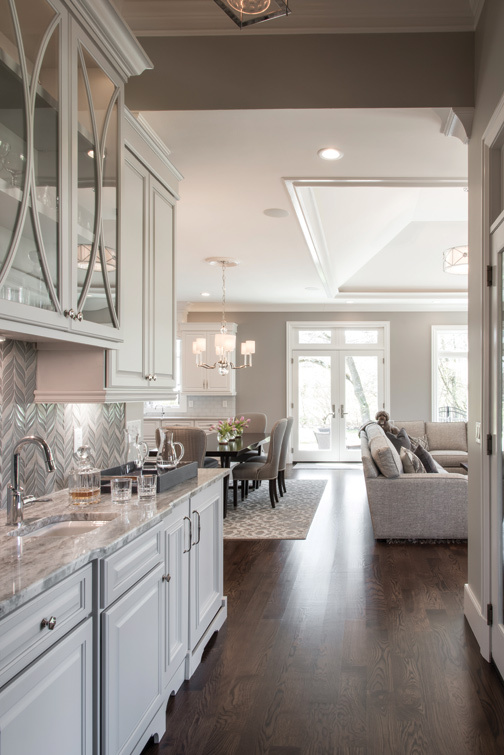 The owners had specified a “white kitchen, but not contemporary,” and Fox Creek Furniture and Woodworks responded with vast expanses of superbly crafted transitional white cabinetry. Mont Blanc quartzite surfaces, clear glass subway tiles with a hint of blue-gray and stainless Sub-Zero and Wolf appliances complete the effect, and a 12-foot contoured island, inset with a farmhouse sink, defines the kitchen from the dining area. Family meals are served on a Mitchell Gold + Bob Williams table, with a lustrous brown finish over Indonesian rosewood, and warm gray walls create a cozy ambience for the adjacent hearth room. The hearth room fireplace is one of five in the home — two wood-burning and three fueled by gas, and the space is furnished with a comfy Ethan Allen sectional, plush area rug, and leather side chairs from Arhaus. Positioned between the hearth room and great room is one of the home’s several wet bars. Custom curved mullions accent the glass cabinet doors, and the backsplash is literally a piece of art, in a glass “feather” pattern by Premier Tile. Dark wood planks accentuate the coffers of the great room ceiling and, creating a dramatic focal point, the fireplace is surrounded by granite and topped with a bold contemporary abstract by Donald Sultan. 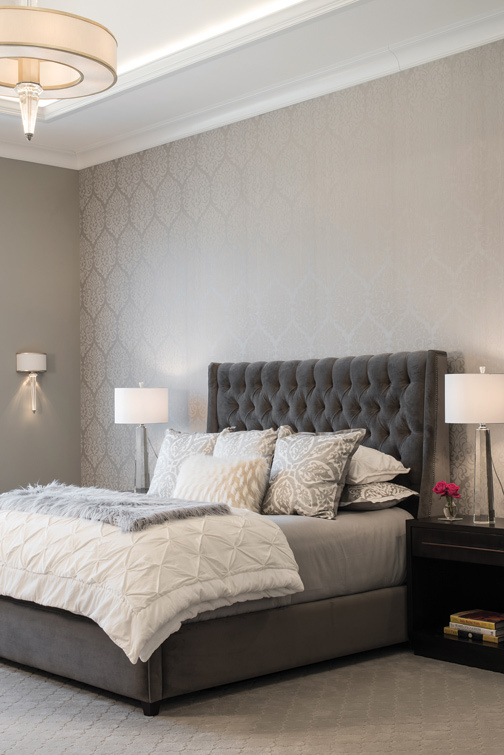 A sumptuous retreat, the master bedroom is warmed by a Heat & Glo fireplace, framed with marble tiles, and the quatrefoil pattern subtly reappears in the wall coverings and sculptured carpeting. 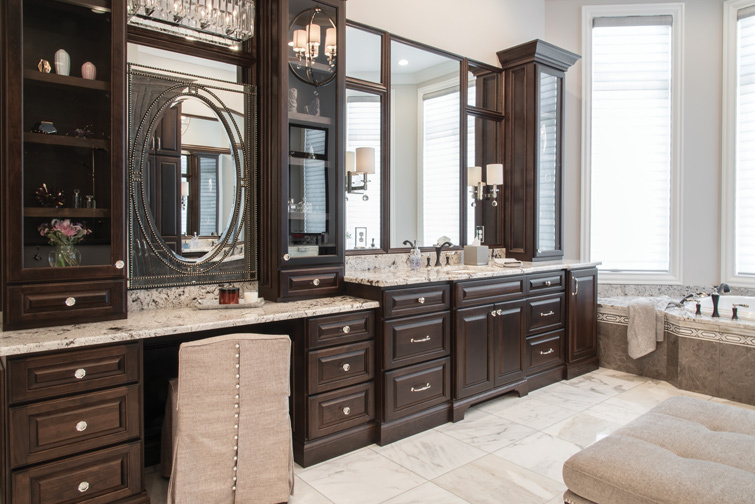 Encircled by rich Fox Creek cabinetry, the room-size closet revolves around a center island, and the master bath virtually defies description. Designed by Tonella, the bath features dark-hued custom cabinets, marble floor tiles, granite surfaces and eye-catching matte black fixtures. A variety of exquisite tile finishes fully encase the dual-rain-head shower, and similar decorative tiles ring the whirlpool tub deck. Entertainment opportunities abound on the lower level, which provides access to the pool and includes a spectacular glass-enclosed wine room, fireside family room with beamed ceiling, multi-level theater with 130-inch screen, and a fabulous “playroom,” outfitted with a handsome bar and poker, billiards and TV viewing areas. “Masterwork” is the term Miceli has coined to describe its luxury custom homes, and it’s a title every member of the team believes must be earned. Without doubt, this extraordinary residence reinforces Miceli Custom Homes’s decades-long reputation as a leader in the St. Louis industry. From site development to the finishing touches, it is truly a Masterwork.